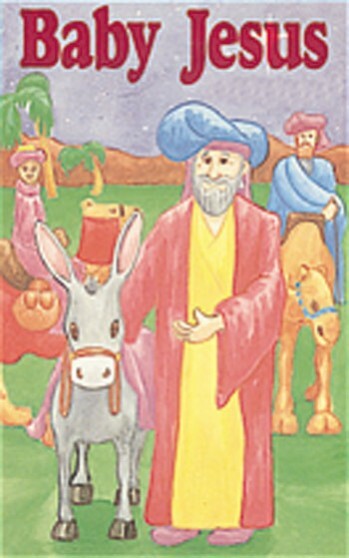 Being reminded by the star atop the Christmas tree of their journey, and after gazing into the nearby manger scene, your child suddenly finds him or herself in the presence of the three Wise Men as told in this Personalized Childrens Book. They invite your child to ride with the caravan on their little donkey. After traveling all night, they arrive in Jerusalem where King Herod invites them into his palace. Although he asks the travelers to bring the baby Jesus to him, your child recollects that Herod really planned to destroy Jesus. We won’t read the whole book to you, but know that Jesus will be in your child’s heart by the end of this wonderful story. An inspirational personalized Christian childrens book that will create Christmas joy for any child. This is a quality personalized children’s book with washable surface and fully illustrated pages in color. Hard cover book, approximately 6" by 9", 24 pages. "Welcome, Madison. You have journeyed from a distant land," said Joseph. The Wise Men entered and bowed low before Mary and Baby Jesus. They presented costly gifts of gold, frankincense and myrrh. Madison crept close to Jesus and His mother, Mary. Jesus was making little baby sounds while his mother hummed a lullaby. "I wish MeMa and Papa were here to feel God's love," Madison said. Mary smiled at Madison and said, "You can always feel God's love if you keep Him close to your heart." The glow of light around the Holy Family became soft and Golden. Jesus slept soundly in his mother's arms. Madison also felt sleepy. Finally, a Wise Man gently lifted Madison onto the little donkey that waited in the Bethlehem night. She quickly fell to sleep during the long ride home. The Wise Man whispered, "Farewell child. We have brought you home to Elgin, Oklahoma." Madison could see that the manger scene near the Christmas tree had changed. The three Wise Men had presented their costly gifts, and the little donkey stood nearby. But Baby Jesus was no longer just lying in the manager. Now, Madison held Jesus close to her heart.